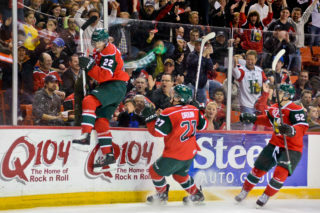 The Mooseheads are feeling good heading on the road for the next two games of their second round series with the Wildcats following a 3-2 win on Saturday to take a 2-0 series stranglehold over their New Brunswick rivals. 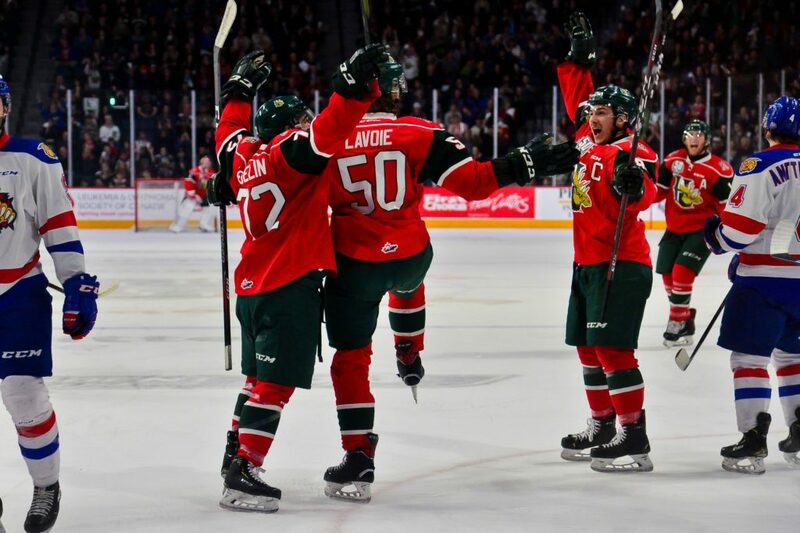 The red hot Raphael Lavoie led the attack with another two goals and Jocktan Chainey scored the game-winner as the Moose prepare to visit the Cats for games 3 & 4 on Tuesday and Wednesday at the Avenir Centre. Moncton tried to claw their way back from a 3-0 deficit with the final two goals of the game but they couldn’t find the equalizer despite a strong effort in the final 40 minutes of the game. Halifax starting building their lead just 6:44 into the contest as Lavoie notched his first of the night when he finished off a play generated by Captain Antoine Morand who forced a turnover and then raced in with the puck on an odd-man rush before passing in front to Lavoie who buried his 10th of the postseason. That had the crowd hopping in excitement at Scotiabank Centre. There were 8,902 in the building and they were loud before the two teams even hit the ice for warmup as Moncton and Halifax fans battled back and forth with chants of go moose go and go cats go. Lavoie put the home team up by a pair when he buried a hard shot off the draw at the 13:26 mark of the first period to bring his QMJHL-leading playoff points total to 18 in nine games. The Mooseheads looked to be in full control early in the second period as they made it 3-0 when Jocktan Chainey scored after some nice passing from Arnaud Durandeau and Maxim Trepanier to set him up for his second tally of the playoffs. The goal came 2:10 into the middle frame but Moncton found a way to change the momentum the rest of the way. The Cats had the puck on their sticks for the majority of the second period and put 18 shots on Alex Gravel in the stanza. The visitors cut into the Mooseheads lead as Mika Cyr struck while shorthanded. Cyr took a shot from the slot that Gravel got a piece of with his glove but it went up in the air and landed in the back of the net. The Cats kept up the pressure in the third period and pulled to within 3-2 at the 9:58 mark when a scramble lead to a point shot by Aleksi Anttalainen that Gravel again got a piece of but the puck got through and rolled across the line. There were tense moments down the stretch but Halifax was able to stave off the Wildcats pressure. The game featured plenty of physical play during and after the whistles which is typical of these two longtime rivals. The final horn sounded with Moncton desperately trying for the tying goal and Cats forward Alexander Khovanov putting a pretty vicious cross check on an unsuspecting Joel Bishop which led to a melee on the ice. Khovanov was handed a five minute major and a game misconduct at the 20 minute mark. His actions did not earn an automatic suspension but it’s expected to be reviewed by the QMJHL. The rough stuff sets up what should be an entertaining battle in Game 3 on Tuesday night at 7pm in the Hub City. Moncton is at home for the next two games and Game 5, if necessary would be held back in Halifax on Friday night at 7pm. Final shots were 30-29 for Moncton as Gravel made 28 saves and Leclerc had 26. The Mooseheads were 0-4 on the power play while the Wildcats were 0-2. Anttalainen was playing in his first game in the series after serving a three-game suspension handed out in the first round. Jordan Spence returned from an injury for the Wildcats and was paired with Anttalainen on defense. Jonathan Aspirot was not in the Moncton lineup after the defenceman was hurt in the series opener.